Please do have a read: it is full of wise advice and thoughtful insights which I think are useful to anyone involved in reducing death and disease from smoking. I’ll just draw a few out. Don’t be alarmed about recreational nicotine. This is a choice some people make, and it is not the business of stop smoking services to make judgements about this. We are not a ‘stop nicotine service’ and if we think getting people off their e-cigarette is a good use of our time, we are ignoring a far more important opportunity to help people quit and to stay off cigarettes. Be open to their choices, and listen to them, especially when they say that they are doing really well with their e-cigarette. …and a realistic take on ‘dual use’, which recognises this as part of a transition for many users, not some sort of lethal dead-end. Yes. There is no evidence that smoking cigarettes and vaping at the same time increases health risks. However, the greatest health benefits are seen when people stop smoking tobacco completely, so quitting smoking should be the goal. 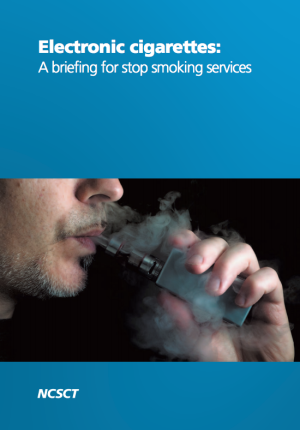 Stop smoking services can provide advice and support to help. Some people manage to switch completely to vaping quickly, whilst others take a little time. You may have to try a number of different e-cigarettes and e-liquids before you find the one that enables you to stop smoking completely, but this is quite normal. … and properly captures the role of flavours in adult vaping, rather than working up hysteria that flavours are only there to entrap children – flavours are integral to the adult vaping experience. How do I choose a flavour? This is a personal choice. Some people start with tobacco flavour, or menthol flavour if they smoke mentholated cigarettes, but one of the advantages of e-cigarettes is that you can experiment and try new flavours. People usually try a few different flavours until they find the one that suits them. Some people choose to move away completely from tobacco flavours, preferring sweet and fruit flavours for example. I’ve heard that e-cigarettes can produce harmful chemicals? Some studies have detected chemicals in e-cigarette vapour that are known to cause health problems. However, these chemicals have been found at very low levels that are unlikely to represent a serious risk to health. When e-cigarettes are used within normal operating levels (e.g. not overheated), there are far fewer harmful chemicals present in their vapour than in tobacco smoke. If the e-liquid is being overheated it tends to produce an acrid, unpleasant taste – you will know if this happens! Is secondhand vapour from e-cigarettes dangerous? Some studies have found traces of toxicants in secondhand vapour, but at such low levels that they do not pose a health risk to bystanders. There is no evidence that secondhand vapour is dangerous to others; however, it helps to be respectful when using e-cigarettes around others, especially non-smokers. The document was produced in partnership with Public Health England. Very well done to the authors: Andy McEwen and Hayden McRobbie …and to the reviewers: Jamie Brown, Lynne Dawkins, Peter Hajek, Wayne Hall, Elspeth Henderson, Sarah Jakes, Lorien Jollye, Joanne Locker, Louise Ross and Robert West. In what must be a global first, the production of this guidance included vapers as reviewers: Sarah Jakes and Lorien Jollye are vapers and consumer representatives from the New Nicotine Alliance. I hope we see more of that attitude of inclusiveness, and a recognition that vapers understand aspects of this behaviour better than health professionals and academics and can contribute to higher quality advice and insights. Note: the NCSCT is a community interest company established to support the delivery of smoking cessation interventions provided by local stop smoking services, support the NHS and Local Authorities to deliver effective evidence-based tobacco control programmes, and deliver training and assessment programmes to stop smoking practitioners and other health care professionals. The UK is leading the way regarding the efficacy and safety of ecigs ~ apart from Drakeford in Wales, of course. The opposers of ecigs are looking ever more stupid, with their outdated ideology, which is unworkable. It’s time for people to take notice and question their conflicts of interest, especially pharma influence and investments in pharma and tobacco shares, which many organisations use for their pensions. Vapers have been right all along and it’s good to see scientists enabling their input. After more than ten years, with no known harms, it should be our human right to use a proven 95%+ safer alternative to cigarettes. It never ceases to disappoint and anger me that the opponents try their hardest to prevent smokers using tobacco harm reduction, whilst wasting $millions of taxpayers’ money on junk science and misinformation to do so. How many lives could have been improved and extended if it weren’t for the ban on snus? We can’t allow the same stupidity with vapourisers. The government have a duty to do their utmost to educate the EU and get Article 20 thrown out of the TPD and then to allow vapourisers to remain just as accessible as cigarettes. The tide is now turning ~ the truth will out! Sure hope my country will follow UK on this which is just fantastic, based on science with a dash of hope. You people in UK, with you Clive and the the PHE gang and some others, are just the best there is on this matter. That’s what makes the difference. Period. Thank you, Clive, for assembling these highlights–I can’t wait to read the full briefing. And a great big “yuuuge”* thank you to all of those who drafted and reviewed the briefing. *Hopefully the US enthusiasm for people talking like this will be a short-lived but potent reminder of human group dynamics and psychology–IMO.